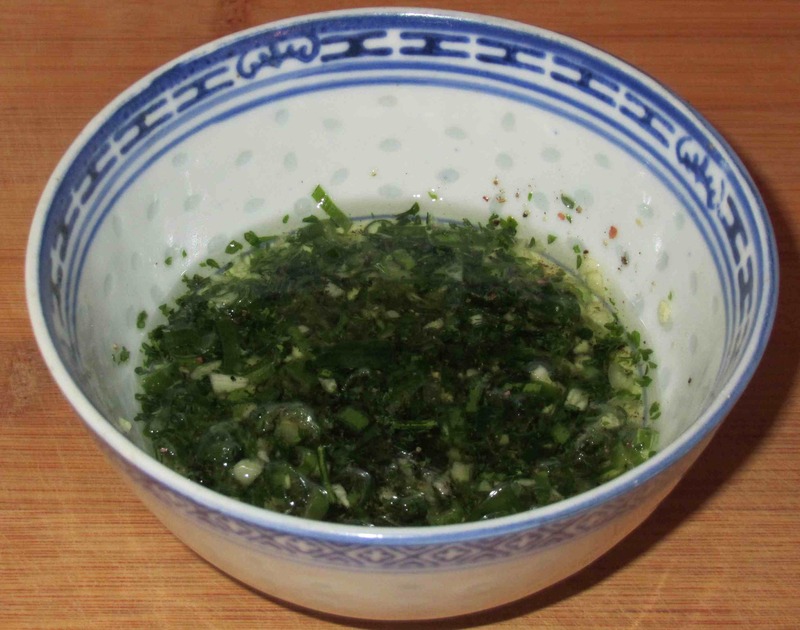 First, combine the garlic, scallion and parsley in a small bowl and grind a little black pepper over everything before pouring over the olive oil. Mix well, crushing the garlic with the back of your spoon and then set aside. You will need to let this sit for at least two hours before using it so as to let the flavor of the garlic and scallion infuse the oil. 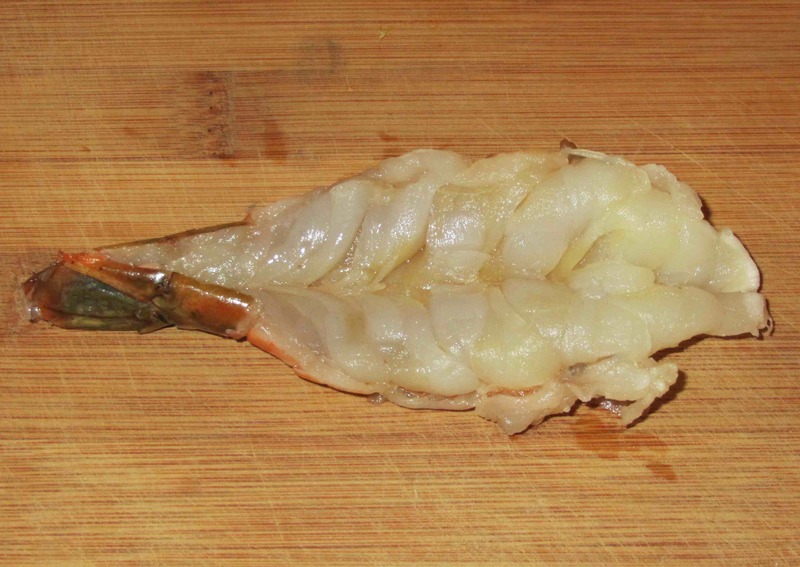 Peel the Prawns, leaving on the tail, and then open up the back and press each flat, butterfly style. It will help if you make a few nicks with a knife in the underside first. Sprinkle each with a little salt and a grinding of pepper. 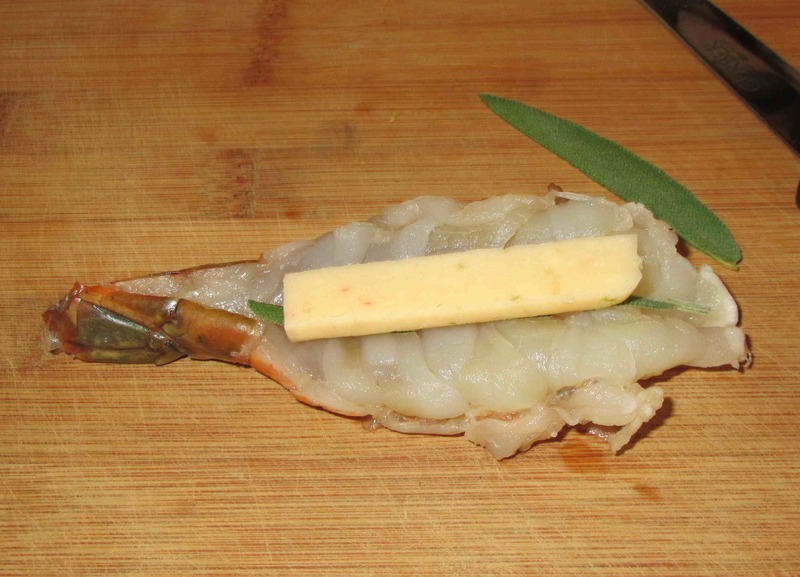 Lay one half of a sage leaf along the slit in the back of each Prawn and top with a stick of cheese. 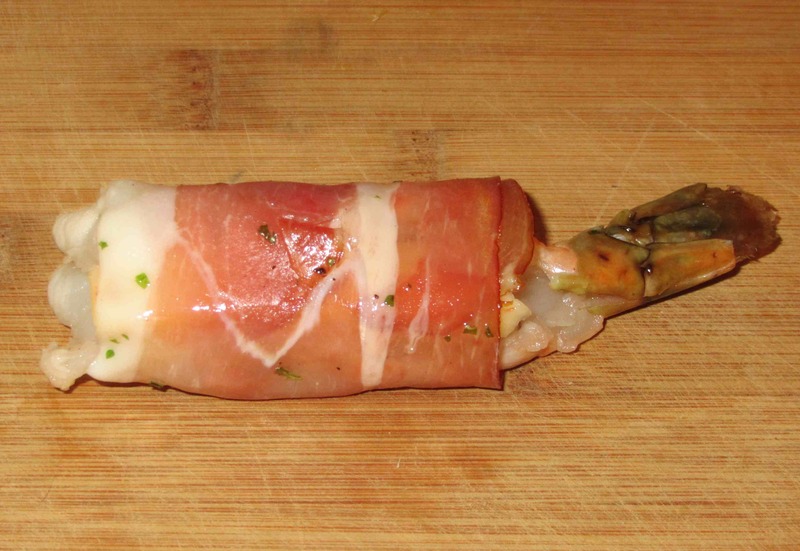 Next, fold the Prawns closed around the filling and wrap tightly in a slice of the Prosciutto. Brush each very lightly with just a little oil from the garlic-scallion mixture. Preheat your oven to 375 degrees and put the Prawns into a lightly oiled baking dish. Bake for twenty minutes or so until the Prawns are cooked and the cheese melted. Plate attractively and drizzle the scallion and garlic oil over top. Serve hot with lemon slices, if desired. My wife and I ate these with a small salad made with celeriac. The prawns were really very tasty but they were also incredibly rich. My wife and I only had three each but, to be honest, that was about all we could manage. 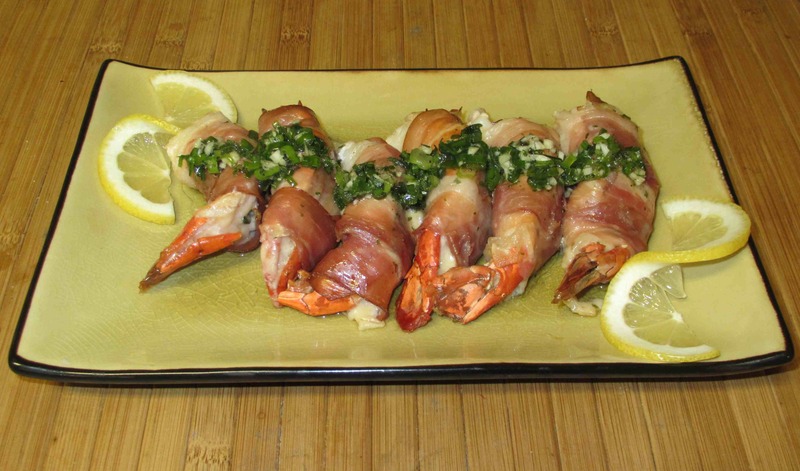 Like bacon wrapped scallops, which we both love, even a little can quickly be too much of a good thing and, next time, I might try doing this with far smaller shrimp. Still, all in all, it was pretty interesting experiment and worth trying again. Looks delicious. I have some big prawns in the freezer back home and was wondering what to do with them. This is what I’ll do when I arrive back next weekend. 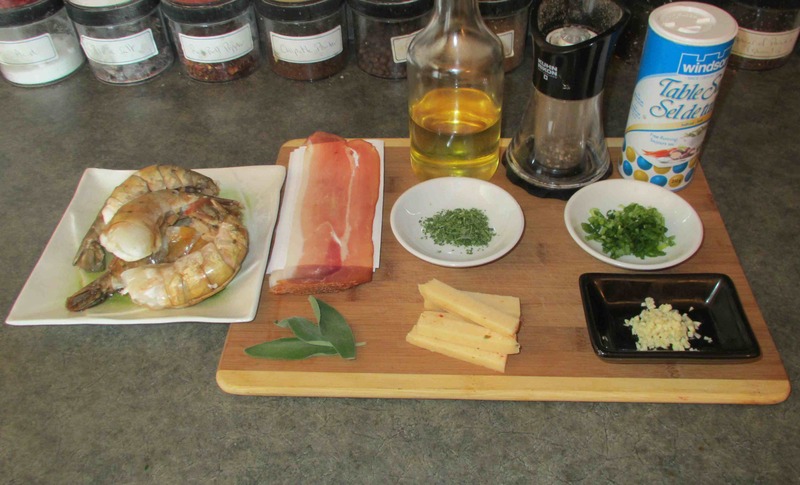 Looks very tasty…I love using prosciutto for so many things..l.why not prawns! They would make a lovely appetizer when entertaining. Do you think perhaps a serving of two? One seems a little chintzy … two is more than enouh. They are quite rich indeed. Wow, what a decadent taste explosion! I love the size of the prawns. I only wish I could get them here. Can this be done with chicken ??? I mean the wrap ???? Oh, for sure…. The usual size of deli-sliced Prosciutto would do a chicken breast very nicely. It would be nice on a grill or in a pan but you would want to keep the heat fairly low so that the Prosciutto wouldn’t burn or get totally dried out before the chicken was cooked through. 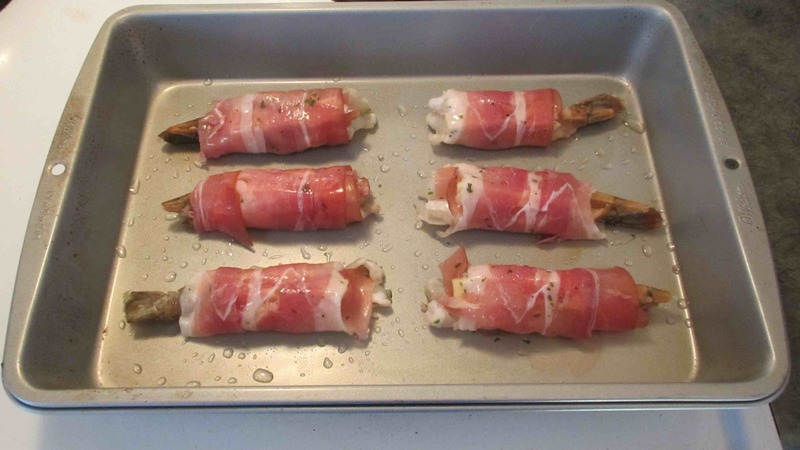 I’ve wrapped bacon around chicken, but not Prosciutto as yet … maybe a future post? ?